Finally, the day had arrived. My first (ever,ever) foreign fashion week show, of nobody other than Hugo Boss. 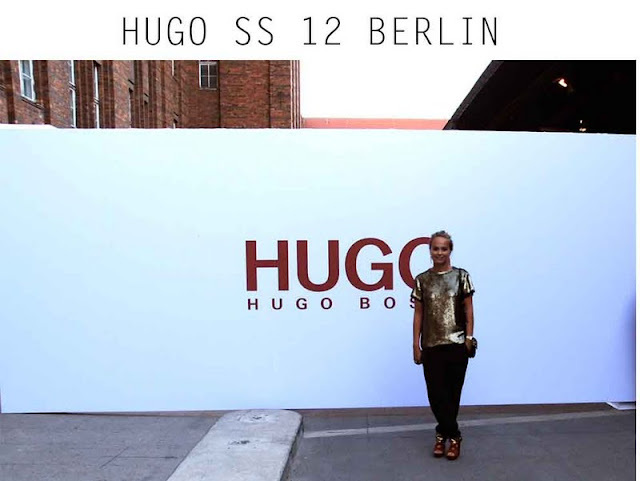 Located in the creative heart of Berlin, Mitte - Hugo set itself apart from other shows with its unique location. Outdoor, surrounded by musea and old industrial facilities you immediately got a taste of something big, international and - how to put this right...- awesome. The very straight-to-the-point show (no beating around the bush) contained many blues, reds, silvers and whites - sometimes interrupted by geometrical shapes with futuristic patterns. The clean detailing and fitting were in clear contrast with the very few breasy and light designs. A show close to Hugo's heart but still very innovative. To top the night of, Hugo invited us for a little dance at the afterparty. 3D video fragments decorated the industrial facades all in harmony with the latest pop songs and a live performance of Little Dragon. P.s. I'm sorry for the impersonal pictures, but since I wasn't allowed to bring my camera inside this is all I can give you. But for some personal scoops, please check out my twitter!